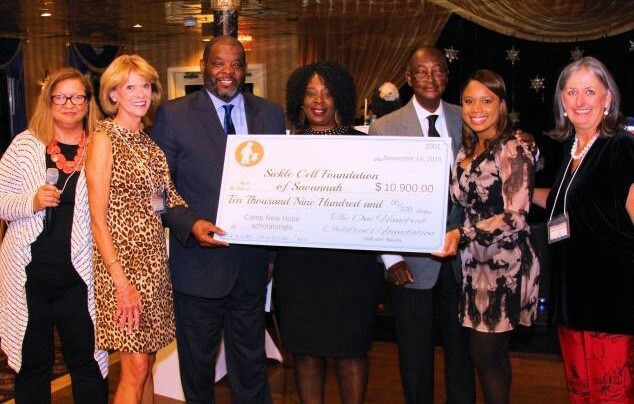 On November 16, 2018, The One Hundred Children’s Foundation celebrated its 24th year by awarding $120,000 to 7 local pediatric charitable organizations. The celebration took place aboard the Georgia Queen, where members of the recipient organizations joined The One Hundred Children’s Foundation members for dinner and dancing. The event was presided over by President Ann Walker, Vice President Carri Stolz, and Grants Allocations Chairwoman Laurie Milano. Baby Bundles for Children’s Hospital Outpatient Clinic and the J.C. Lewis Primary Health Center $10,490. Camp scholarships to Adam Fisher (Diabetes) shared between St. Joseph / Candler $18,720. The One Hundred Children’s Foundation was founded in 1994 by Dr. Edwin Shepard to raise money in support of the many needs of the Children’s Hospital at Memorial. To date the organization had raised more than $4 million dollars for the Dwaine and Cynthia Willett Children’s Hospital, including the Pediatric Emergency Room currently under construction. For its first 24 years it operated under the Memorial Health Foundation, but recently transitioned to a Not For Profit 501c (3) Foundation. The OHCF announced that they will continue supporting the Willett Children’s Hospital by now funding outreach programs that directly serve children and their families. In addition they will now expand its fundraising and grants reach to other pediatric health and wellness charitable organizations in Chatham County, Ga. When John Finney, chair of the Sickle Cell Association of Savannah, received the news of the $10,900 Grant Award he stated, “This is an historic day for our organization and I would not miss attending this honorable event.” John Finney started the Sickle Cell Association in 1974 and has been a long standing advocate for both children and adults with Sickle Cell Disease. Mr. Finney was the former executive director of the Savannah EOA for 48 years, addressing the concerns of the county’s most needy citizens.